Are you someone who is looking for a corporate cooler bag? Are you someone who uses cooler bags for day to day purposes? Are you a person who needs a nice picnic and cooler bag that they can carry with them at all times? 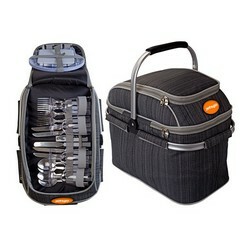 If you are someone who is looking for a corporate cooler bag, the picnic/cooler set at Giftwrap is an ideal find. Giftwrap offers the Dmidlands picnic bag and cooler- this is a picnic bag that comes with an aluminum frame which will ensure that it lasts for a good amount of time. Moreover, this cooler bag comes with picnic cutlery and plates for at least 4 people to hold in the top section and along with this, there is an insulated cooler section at the bottom that ensures your glasses and drinks are all cool. We recommend the corporate cooler bag for anyone who needs something that they can use on a daily basis. Please browse through the items below. If you are interested click the "Request Quotation" link next to each item. A customer service consultant will contact you with a quote. Price estimate excludes branding, VAT and volume discounts apply.